"Do you find it difficult getting hold of glue and stuff?" Making good his escape on the stolen bike, Charles freewheels at speed down the roadway — hoping to flee the area, and his pursuers. Moments later, he suffers a disabling puncture, and ditches the bike. Description: The roadway along which Charles cycles is in the heart of Monsal valley. 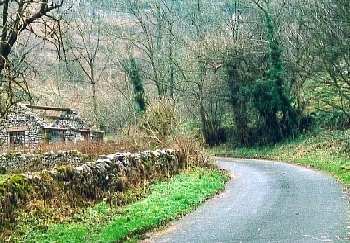 It leads up across the bridge beneath which Charles hides, passing over the valley crossroads (where the dry-stone wall Charles demolishes is located) and leading uphill past the small hut visible here. Where is it? : The crossroads in Monsal valley is a central reference point for all locations in the local area. The roadway that Charles cycles along is the only one of the four leading immediately uphill from that point. Where's the best vantage point? : It is easy to replicate the camera locations along Charles' route, although, naturally, care must be taken when standing in the middle of the public roadway to take photographs. Anything else? : Since 1977, many of the properties in the Monsal valley area have been renovated. The delapidated hut visible here is an exception to this. 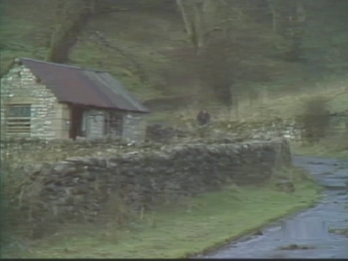 The hut remains within (often waterlogged) grazing fields unchanged in the years since the episode was filmed. Numerous other Monsal locations are nearby — including Fenton's house.